Dubai officials say they plan to use Chinese-made drones to launch a self-flying air taxi as soon as July. The Chinese-made EHang 184 drone has four propeller wings. It is designed to carry one passenger - weighing up to 100 kilograms - and a small piece of luggage. The head of Dubai's Roads and Transportation Authority says the autonomous taxi has already been tested in the city-state. He said regular service is expected to begin by July. The egg-shaped aircraft can reach a top speed of 160 kilometers per hour. It can operate for up to 30 minutes on a single battery charge, with a flying range of 50 kilometers. A video demonstration of the air taxi shows the whole trip being automated. Drones can be requested through an app to arrive at an approved pickup location. The passenger then climbs in and enters the desired destination into a device built into the seat. The auto-piloted aircraft then powers up, takes off and heads to the drop-off location. Officials from EHang say all movements and functions of the drone will be monitored by people in a "Command and Control Center" on the ground. The person inside the aircraft will also be able to communicate with the command center if needed. EHang said it has done major testing on its 184 vehicle in China over the past few years. It has also developed and sells several consumer drone models controlled by remote devices. Last year, EHang signed an agreement with officials in the western state of Nevada to conduct test flights of the EHang 184. Nevada operates a testing center in cooperation with the U.S. Federal Aviation Administration, or FAA. The goal is to get FAA approval for the EHang 184 to fly in the United States. The company has said the drones could have other uses besides carrying passengers in the air in busy cities. They could also help in emergency rescue operations or deliver human organs. Dubai is the commercial capital of the oil-rich United Arab Emirates in the Persian Gulf. Officials there have long been pushing to adopt high-tech transportation alternatives. The ruler of the city-state has said that by 2030, at least 25 percent of all passenger trips are to be completed with driverless vehicles. Dubai is already home to the world's longest driverless rail line. It also signed a deal with American businessman Elon Musk to look into building his proposed super-fast Hyperloop system. 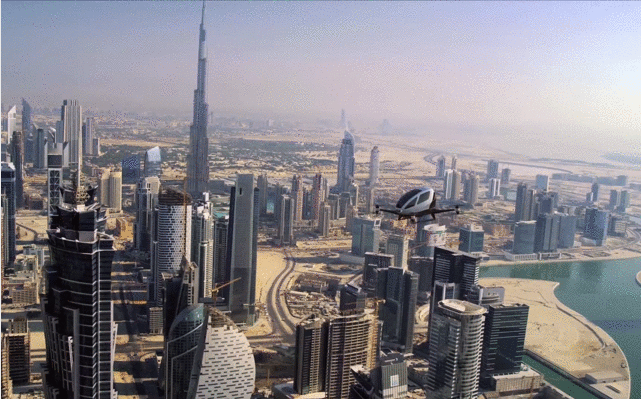 Officials in Dubai have not outlined special regulations for the air taxi system. Currently, people who operate drones are required to register the aircraft. Last year, several drone incidents around Dubai International Airport, causing officials to briefly ground flights at the facility - one of the world's busiest. We'll serve you cookies and drinks soon after the plane takes off. China's criminal law has special regulations on juvenile crime and criminal responsibility. We drove to the airport the next morning to pick up Susan. 1.Dubai officials say they plan to use Chinese-made drones to launch a self-flying air taxi as soon as July. 2.It also signed a deal with American businessman Elon Musk to look into building his proposed super-fast Hyperloop system. I signed a deal with those guys. I just signed a deal with schleine records.